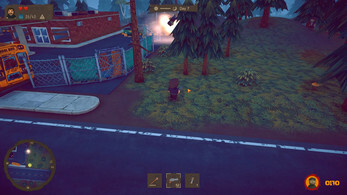 A road trip among the walking dead in a 3D post-apocalyptic stylized world. This game is about having fun by shooting, exploding and trapping zombies with every stuff you can find (weapons, vehicles and more). By purchasing the game now, you're supporting the development with only one DISCOUNTED payment and having access for all updates forever including the final release. That said, even if the game is not yet polished, all released features are very stable so you can already have fun playing the game. Who am I and why supporting the development? Note : In the final release, your road trip will be made of different maps in a random order, with random resources and procedurally generated zombies so each game is different ! In The Middle Of Zombies is a full 3D game with graphic option settings so it can run even with low graphic cards but your experience would be better with a recent system.